The 2017 MLB regular season was completed on Sunday and bookmakers in Vegas have updated their odds for the 10 teams that reached the playoffs. Before the season, the defending champion Chicago Cubs had 3-1 odds to win, which means that bookmakers believed that their chances were about 25% to repeat as World Series champs after last year’s triumph. Now, that number has dropped, but which teams are favorites to win World Series right now? 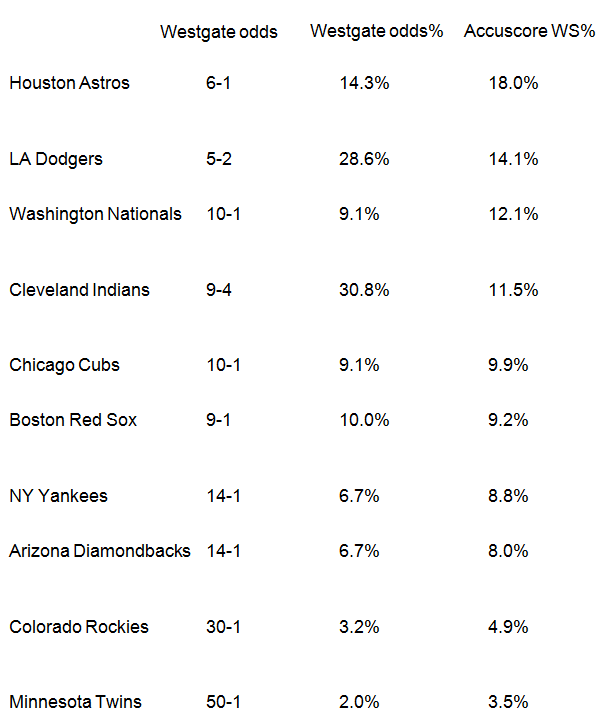 The table below shows current World Series odds from Westgate Las Vegas Super Book with Accuscore’s predictions side-by-side. These predictions are based on 10,000 simulations of every postseason game. As we can see, Cleveland and the LA Dodgers have jumped up to the clear favorites to win this World Series. Their combined win probability based on odds from Westgate is close to 60%. However, Accuscore’s simulations are exactly in agreement with those numbers. Based on Accuscore, the Houston Astros will continue pounding runs in the postseason, and they are predicted to be World Series winners this year. There is also some value for the Washington National’s to go on a title run when Accuscore and Westgate numbers are analyzed. As many times earlier, we can find value for long shots as well, but if the probability to win the bet is under 5% once a year, that rarely generates profitable cash flow in your betting fund. The New York Yankees could be the dark horse in ALDS, if they perform as predicted against Minnesota in Tuesday’s Wild Card game. The series between Cleveland and the New York Yankees can be evenly matched, as many estimate, and there is good chance for a Yankee’s surprise. Outside of that, we expect that Washington, Houston and Los Angeles will proceed to the league championship series without game 5s being necessary.